Since I work for myself, I talk a lot about what I do. Since I do my own marketing, I think a lot about who I should be talking to. And who I want to work with. When I boil it down? I want to work with cool people who’re doing cool stuff. And as a matter of course, I seek out businesses who have a budget for website copy. Leggings and coffee don’t pay for themselves. Sometimes people who’re low on cash are doing cool stuff, too. When you’re starting off in business, or when you’re in the weeds two years later, you might not have hundreds or thousands of dollars to totally overhaul your website. And I want to help you, too. 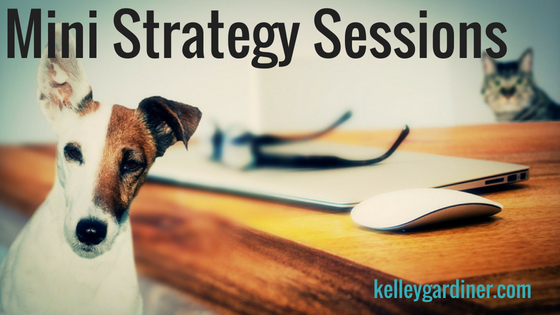 Right now, I’m offering one strategy session slot a month for $20. They’re usually $150. This is available to fun people who do cool stuff, but aren’t able to get the cash to pay professional rates yet. That doesn’t cover my expenses. It covers my need to include more people in the conversation. I reserve the right to close this at any time, and to pick and choose who I work with. It might get booked out in advance. We all got help along the way. I can help, too. Email hello@kelleygardiner.com, and we’ll talk about availability. Feel free to pass this along. Thanks pals!